July 27, 1940 was the film debut of an animated character who managed to trick the hunter who was always twying to catch him. Can You Guess what carrot-crunching critter made his debut on this date? Antonio Lucio Vivaldi was born on March 4th, 1678. His father, Giovanni Battista Vivaldi, was a barber who played violin. Giovanni was Antonio's first violin teacher. They performed together many times in public and were very popular. Antonio learned well and became a master violinist, always amazing listeners with his wild bowing. 1781 - Mauro Giuseppe Sergio Pantano Giuliani, Italian composer and guitar virtuoso, was born. 1783 - John Philipp Kimberger, German composer and writer, died in Berlin. 1918 - Leonard Rose, American cellist, was born. 1918 - Gustav Kobbe', American music critic, was killed off the coast of Long Island when a navy seaplane struck the mast of his boat. His Complete Opera Book became a standard. 1927 - Kurt Weill and Paul Hindemith's radio cantata Der Lindbergflug "Lindberg's Flight" at the Baden-Baden Musiktag festival in Germany. 1955 - Chuck Berry's first hit record, Maybellene entered the R&B chart. 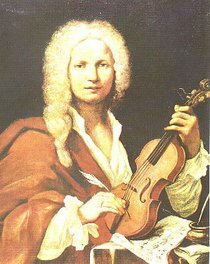 Vivaldi was ordained a priest in 1703. Within a year of his ordination he said he no longer wished to celebrate mass because of physical complaints ("tightness of the chest"). Vivaldi, while remaining a priest, was employed for most of his working life by the Ospedale della Piet�. Often called an "orphanage", was well endowed by the "anonymous" fathers. The young ladies were well cared for, and its musical standards among the highest in Venice. Vivaldi joined the school in 1703 as violin teacher, and was reappointed every year until 1709. He rejoined the school in 1711. During the 1709-1711 period Vivaldi continued to compose. In 1711 twelve concertos he had written were published in Amsterdam by the music publisher Estienne Roger under the title l'Estro armonico (Harmonic Inspiration). In 1713, Vivaldi was given a month's leave from the school to stage his first opera, Ottone in villa, in Vicenza. He was attached to the Teatro Sant' Angelo during 1713-14. In November, 1716, Vivaldi's Juditha Triumphans devicta Holofernis barbaric was produced at the Ospedale della Piet�. In 1717 Vivaldi moved to Mantua for two years act as Chamber Capellmeister in the court of Landgrave Philips van Hessen-Darmstadt. There he was tasked with writing operas and cantatas. In 1719 Vivaldi's operas Teuzzone and Tito Manlio were produced there. There is a note on the score of Tito Manlio that the music was written by Vivaldi in just 5 days. In Rome Vivaldi found a patron in Cardinal Pietro Ottoboni, a great music lover, who had once been the patron of Arcangelo Corelli. According to Vivaldi, the Pope even asked him to come and play the violin for him at a private audience. Other composers such as Geminiani and Handel worked in Rome for periods of time. Like them, Vivaldi profited from the favorable cultural climate in the city. Despite his stay in Rome and other cities, Vivaldi remained in the service of the Ospedale della Piet�, which named him "Maestro di concerti." He was required to send two concertos per month to Venice. His presence was never required. He also remained director of the Teatro Sant' Angelo. During these years Vivaldi was also extremely active writing concertos. In 1725 Il Cimento dell' Armenia e dell'invenzione (The trial of harmony and invention), opus 8 was published in Amsterdam. This consisted of twelve concertos, seven of which were descriptive: The Four Seasons, Storm at Sea, Pleasure and The Hunt. These concertos were enormously successful, particularly in France. The Four Seasons is still probably Vivaldi's best known work. Antonio Vivaldi died on July 28th 1741 "of internal fire" (probably the asthmatic bronchitis from which he suffered all his life) and, like Mozart fifty years later, received a modest burial. A Great DVD by a Wonderful Young Violinist. Julia Fischer. See Excerpts on her website.